Texas Christian University is a world-class, ‘values-centered’ university located in Fort Worth, Texas. The 283-park like campus, just five miles from downtown Fort Worth is home to just under 9,000 undergraduates. Recognized by Forbes Magazine as a rising star, the university is open to students of all faiths. 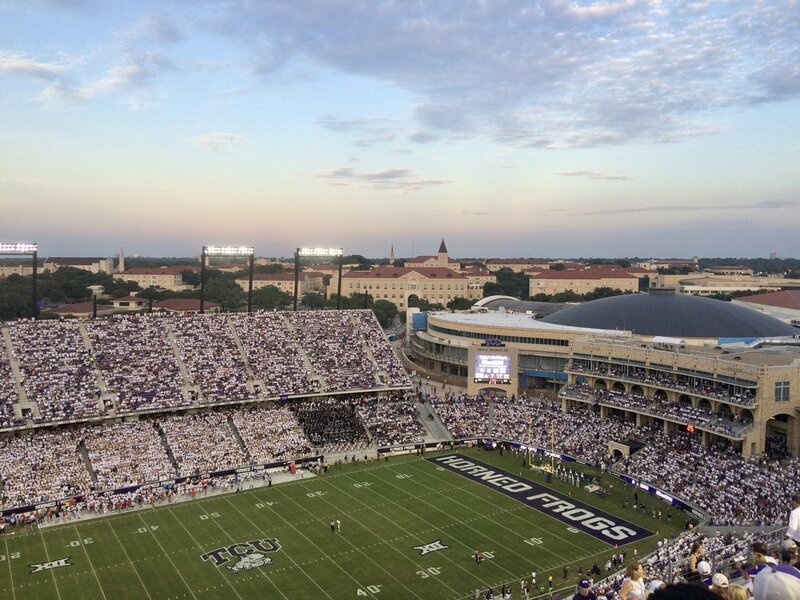 Horned Frog sports teams are a big draw for students, especially when it comes to football. (TCU’s horned frog mascot is named for the state reptile of Texas.) Fort Worth is known as the city of Cowboys and Culture known with an Old West feel and a vibrant downtown cultural district. Airport: Fly into Dallas Love Field or Dallas/Fort Worth International Airport, TCU is approximately a half hour drive from each terminal. Stay: The Courtyard by Marriott University Drive is within walking distance to TCU's campus and the most convenient choice. (It’s also right across the street from Woodshed, the popular and lively smokehouse mentioned below.) If you prefer to stay in downtown Fort Worth the Omni is our top choice, right next door to the Fort Worth Water Gardens. The Ashton is another great option. Coffee: Go for the vintage vibe and amazing coffee at Brewed on Magnolia Avenue, (a popular street with eclectic shops, restaurants and bars.) At all times of the day students love to mingle on the outside patio, complete with fire pits and picnic tables. Avoca with two locations on West 7th and on Magnolia are also popular coffee shops where students eat, drink, and study. For a quick coffee closer to campus head to Einstein Bros or there’s a Starbucks at the TCU bookstore. Lunch: For a fun lunch head to the Fort Worth Food Park where there’s a large array of food trucks from top local chefs. There is ample seating outside and a cantina serving craft beers and a full bar. On University Drive, where you’ll get to see the students showing off their purple attire, head to Pizza Snob for build your pizza pies or Dutch’s for a burger with home made fries. For those eating healthy, Righteous Foods delivers with a menu stocked with tasty bowls, wraps and salads. Casual: Woodshed Smokehouse is one of the most popular lunch and dinner spot among the TCU students and Fort Worth community. Come here for a taste of classic Texas barbecue. There is a mix of indoor and outdoor seating conducive to any season: fans blow cool air and mist during the Texas heat and blankets and heaters keep everyone toasty during the cooler season. You can walk from TCU's campus and it’s located right next to the Trinity River. You can’t leave Fort Worth without a visit to the Stockyards and a margarita on the rocks with a side of chips and queso from Joe T Garcia's. A staple since 1935, this beloved tex-mex believes in quality over quantity. A Step Up: One students states: “ When Mom and Dad are paying, I take them downtown to Reata, an upscale southwestern restaurant serving great food, drinks and a good time. The rooftop bar offers great views of Fort Worth. Another good choice is to head over to Magnolia and dine at Ellerbe, formerly a gas station, now a farm to table fine dining destination. The mood is quieter at Ellerbe’s than Reata, however there is always something fun happening on Magnolia.“ We also hear good things about Waters with a seafood centric menu from local chef Jon Bonnell. Sweets: Melt Ice Cream, located on Magnolia, is a great spot to hit after dinner. Steel City Pops has numerous locations around Fort Worth, the most popular being on West 7th which one students describes as “a small, downtown version of Fort Worth where you’ll find TCU students and young graduates." Local Attractions: Walk around the Stockyards and attend a concert at Billy Bob's Honky Tonk! Visit the Fort Worth Zoo or Water Gardens downtown. Go to TopGolf for a fun afternoon of hitting golf balls and talking with locals. Visit the acclaimed collection of post WW11 at the Modern Art Museum of Fort Worth sprawled across five pavilions set into a reflecting pool. Café Modern in the museum is a nice place to have lunch before or after a visit. Just toured the TCU Campus? Are you a TCU student, parent or Alumni? Fill out this 2 minute survey to supplement our Daytripper University Guide for TCU!